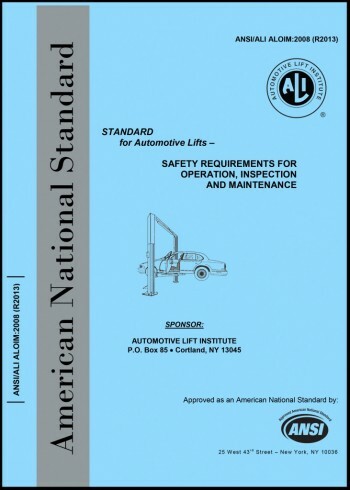 The ANSI/ALI ALOIM is the Standard for Automotive Lifts – Safety Requirements for Operation, Inspection and Maintenance. This American National Standard represents the reaffirmation of the 2008 Edition. Effective date – June 20, 2014. Electronic version not yet available. Includes same order quantity of Safety Tips Cards. PREPAYMENT REQUIRED. Payment may be submitted by check drawn on a U.S. bank or by International money order. Payment may also be made via credit card (Visa, MasterCard, Discover and American Express). NOTE: ALI materials are copyrighted and may not be reproduced without written permission from the Automotive Lift Institute. Unused items may be returned within 14 days of receipt, in new condition and in their original packaging. Returns & exchanges are subject to a 20% restocking fee plus applicable shipping charges; please call (607) 756-7775 for details and pricing. Refunds are NOT available for the Lift Inspector Certification Program registration fee. Only KPA can offer a refund for the KPA Online Training Subscription.